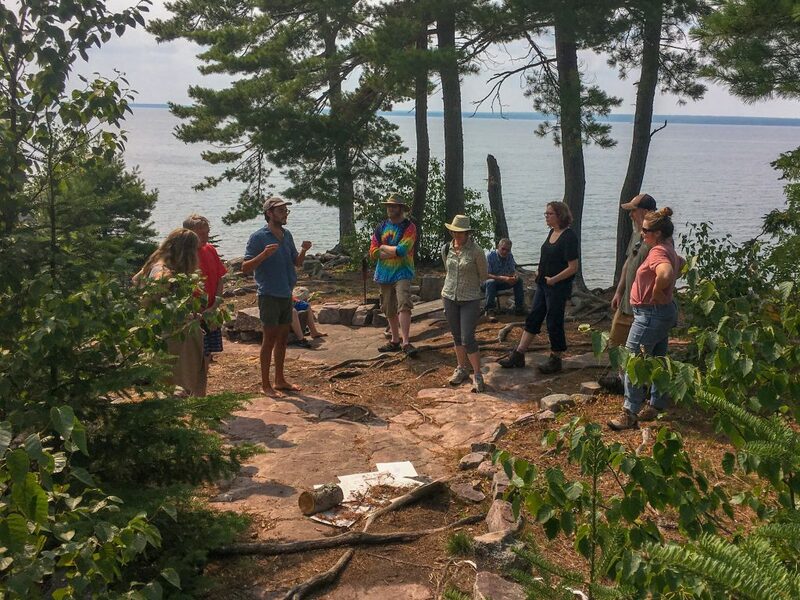 Artist talk beginning at 7:20 p.m.
Rabbit Island in Lake Superior. Photo courtesy of Rob Gorski. Finlandia University Gallery will present A Sense of Place: Works from Rabbit Island, an exhibit featuring the collected works of 13 artists who participated in the Rabbit Island Foundation Residency Program. Several short films created on and about Rabbit Island will also be on display. Founded in 2010 by Andrew Ranville and Rob Gorski this residency hosts artists, writers and researchers from a wide variety of disciplines. A Sense of Place: Works from Rabbit Island will be on display at the Finlandia University Gallery, located in the Finnish American Heritage Center, Hancock, from September 20 to October 19, 2018. Exhibited as the Rabbit Island Collection for the first time, the artworks in the exhibition have been donated by former resident artists and collaborators. Beyond highlighting the contributions of artists and contributors to the foundation’s tenets, these works also provides a diverse and detailed portrait of the island. An opening reception for the public will take place at the gallery on Thursday, September 20, from 7 to 8:30 p.m. Co-founder Andrew Ranville and artist Calvin Rocchio, who has recently completed his residency on Rabbit Island will give a talk beginning at 7:20 p.m. The reception is free and open to the public. Refreshments will be served. 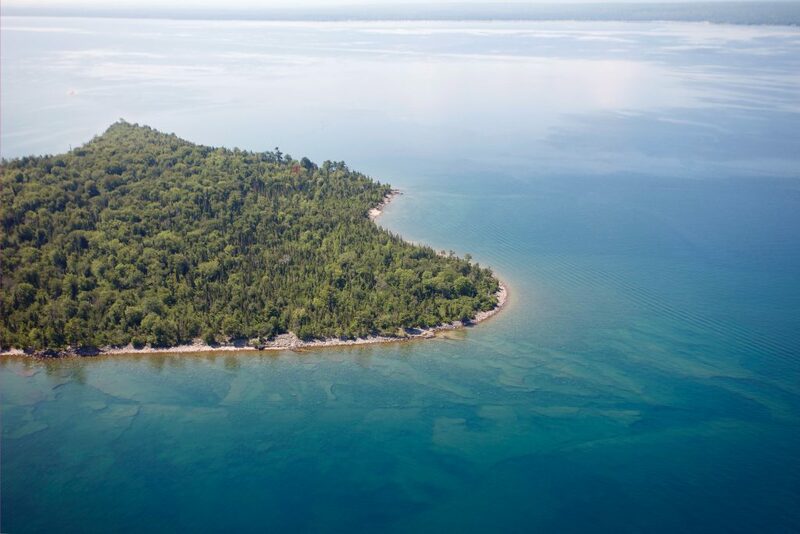 Located four miles east of the Keweenaw Peninsula, Rabbit Island is a protected 91 acre wilderness. Since 2013, the Rabbit Island Foundation Residency Program has received approximately 1,000 applications from 37 countries, and has awarded 26 fully supported residencies. Additionally, nearly 60 artistic collaborations have taken place. The program operates between June and September, championing the advancement of artistic and ecological thought. Calvin Rocchio on Rabbit Island in Lake Superior. Photo courtesy of Andrew Ranville. Calvin Rocchio, an artist from Northern California will soon be finishing his Rabbit Island residency and will be just off the island to share his experiences at the opening reception. “My practice, through what’s accumulated practicing openly and perpetually, amounts to an ecological ontology––a way of being in the world that’s pliable / wavy / soft / permeable,” said Rocchio. Focusing on our relationship to the environment, Rocchio’s prior work has included workshops on how to inhabit outside spaces; gatherings and performative readings across the country at the local sites of environmental debates; and self published essays and open source environmental readers. A Sense of Place: Works from Rabbit Islandwill be on display at the Finlandia University Gallery through October 19, 2018. The exhibiting artists are Julieta Aguinaco (Mexico City, Mexico), Beau Carey (Albuquerque, New Mexico), Luce Choules (London, United Kingdom), Sarah Demoen (Brussels, Belgium), Jack Forinash (New Cuyama, California), Kelly Gregory (San Francisco Bay, California), Helen Lovelee (Sydney, Australia), Miles Mattison (Oakland, California and Ann Arbor, Michigan), Josefina Muñoz (Santiago, Chile), Andrew Ranville(London, United Kingdom and Calumet, Michigan), Isabella Rose Martin (United Kingdom/Denmark), Walter van Broekhuizen (Amsterdam, The Netherlands) and Mary Welcome (Palouse, Washington). The Finlandia University Gallery is in the Finnish American Heritage Center, 435 Quincy Street, Hancock. Gallery hours are Monday to Friday 8 a.m. to 4:30 p.m. , Thursday 8 a.m. to 7 p.m., Saturday 12 p.m. to 4 p.m. Learn more about this exhibit, other exhibits and the Finlandia University Gallery in general by visiting finlandia.edu/universitygallery.